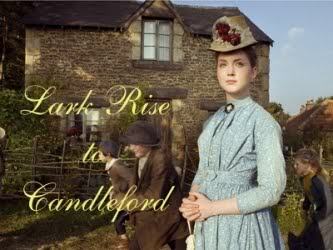 The loveliness of the BBC’s Lark Rise to Candleford is unsurpassed in all television history, I think. Each series surpassed the one before in its beauty – beautiful scenery, beautiful humour and laughter, and the beauty of human foibles and human kindness. The attention to detail in the settings and the brilliant performances of the actors came together so perfectly. Lark Rise evokes a sense of another age but at the same time captures the age of innocence with which we all associate. It’s interesting, however, that when the clock was brought to the village of Candleford, or when there was a possibility that the Post Office would disappear, there was a real sense of fear of things changing and life never being the same again. In Cranford, the coming of the railway line evokes the same fear; and in the beautiful Thrush Green by Miss Read – set almost a century later – there is a fear that life will never be the same again if the annual fair stops coming to the village. Perhaps it is the sense of the transience of beauty which makes situations and particular times and places all the more beautiful. On the one hand, we look back at a time when life was so different and appears so much more beautiful, and on the other hand we see even then the same fears of change and the same characters that we meet today, albeit in different circumstances. While Cranford and Lark Rise have grown in popularity in recent years, Miss Read’s beautiful Thrush Green remains one of those hidden treasures that are only gradually coming to light again. Miss Read’s style is uniquely beautiful. The novels at first appear very simple but that demonstrates the brilliance of the author’s technique. She moves effortlessly from one viewpoint to another character’s viewpoint of the same scene and cleverly introduces the next character, who then takes over the story. The method of creating suspense is also remarkable. In a few short scenes the author inspires in the reader a desire to know what is happening or what has happened to several characters at once – what is wrong with Mrs. Curdle? What happened to break Ruth’s heart? Will she and the doctor start a romance? Will Paul be able to go to the fair? Will Sam be caught stealing? – so many apparently trivial questions suddenly take on great importance, and that is surely the genius of a great writer! 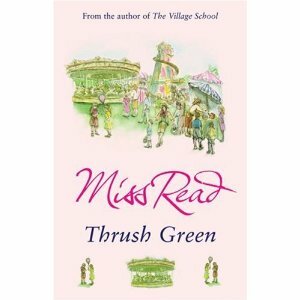 Better yet, Thrush Green presents so many beautiful scenes through the eyes of the very different characters. One of the most magical scenes is the little boy, Paul’s imaginative journey over the village as a great bird tearing the roofs from building to view them from above. The descriptions are magnificent and seeing the world through the eyes of a child is wonderful! There will always be beauty. Whether it be in the lanes of Lark Rise or Cranford or Thrush Green, or perhaps in the villages and towns today, the same mystical sense of capturing beautiful moments remains and as long as there is an author to capture it, it cannot fade.